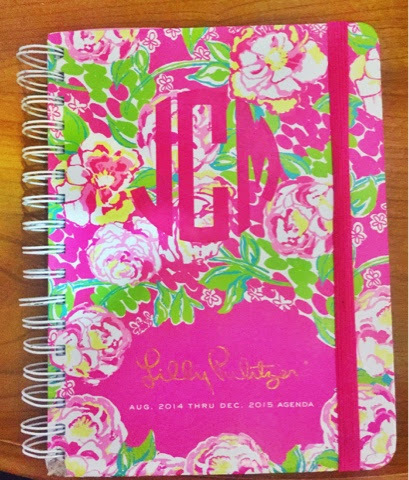 An In Depth Tour of my Lilly Pulitzer Agenda – Pinky and the Prep! 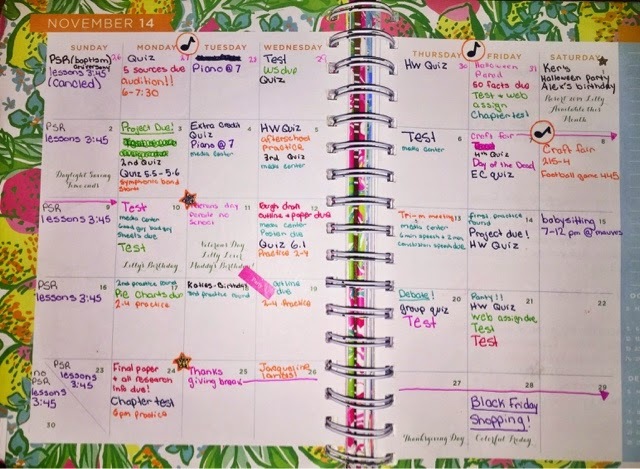 I got a request, right after I published my tips for a successful second semester, to do a more in depth look as to how I organize my planner. I was thrilled to know that some of you were interested and I hope that my methods of organizing my life are helpful! I would love to hear your guy’s tips as well!! Enjoy! First and foremost, here is a little backround on my agenda. This is the large Lilly Pulitzer adgenda that covers August 2014- December 2015. The large size is perfect for my day to day use! It it smaller that the average folder and note book, so it fits easily in my back pack and my purse. It is also big enough that I have space to write as much as I please! The first part of this adgenda that I use is the monthly view. This shows the whole month on two pages. Here I write important things that I need to know for that month, like birthdays, due dates of big projects, competitions, ect. At the beginning of the academic year I assign each class a color. This color is the same color as the note book and folder I use in the class. Which ever color folder it is, I will use the same color pen. 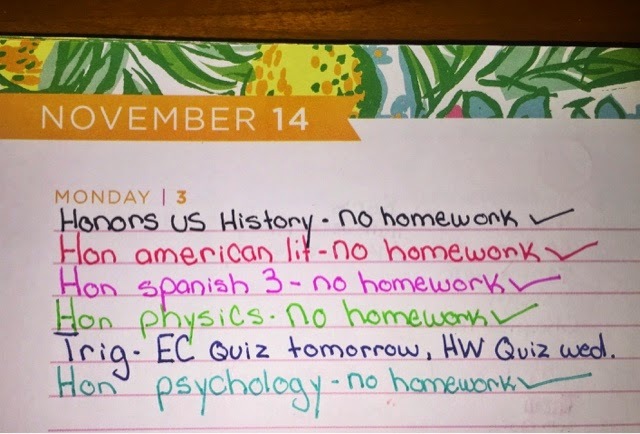 That way, in my planner I can just write “test” on that day instead of writing “American literature test.” This way I know as soon as I look at it what class I’m dealing with. For example when it says “test” in green I automatically know I have a physics test. Next I assign all my after school activities and out of school activities a color. I use different colors for theses just so it is easier to see them next to my class’s colors. For example the piano lessons that I take are written in purple. The after school activities that involve the school I write in our school colors, orange and black. I also use stickers to highlight extra important dates. The music notes symbolize important band related activities like auditions and competitions. The Stars symbolize non band related special events like homecoming and parties! The weekly view is next. This is two pages devoted to one week. The week days have bigger spaces, and Saturday and Sunday are smaller. And know exactly what homework I need to accomplish that night. Here is an up close look at my schedule for Monday. Once I’ve completed what ever needs to be done for that night I put a check mark next to it. This keeps a visual tally going on what I need to get done. 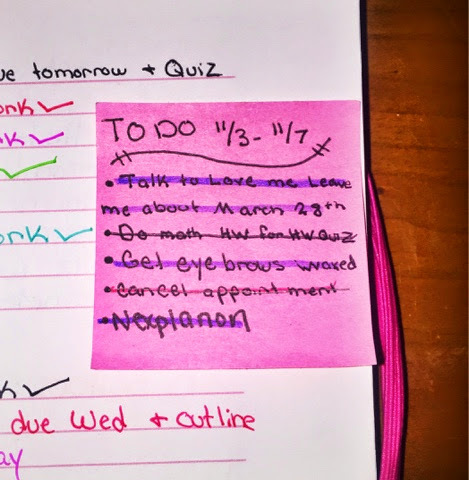 I always love to stick sticky notes to my weekly view to remind my self of tasks I need to accomplish that week. This includes chores, homework that will take more than a day to complete, projects, and practicing. I also put the date at the top of my to do list to remind my self of the time frame I have to complete it. 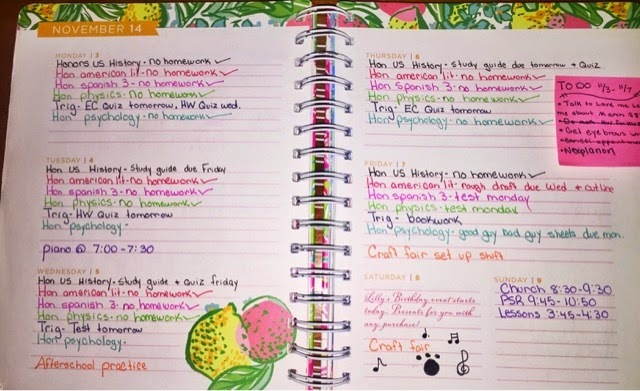 I hope you enjoyed a walk through of my planner organization and how I like to keep myself on task! Thank you so much for reading it and I hope you found my way of organizing my planner helpful! Please feel free to leave me any tips that you think are essential to keeping an organized agenda! !